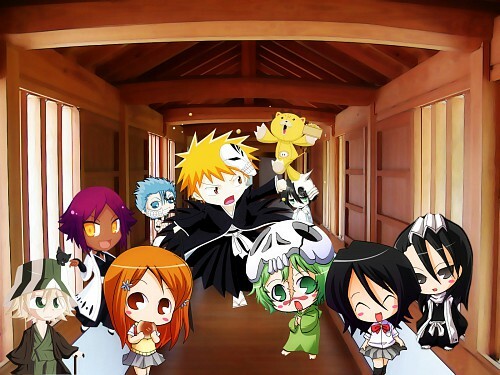 Chibi Bleach... Aren't they cute ? The background picture is from http://www.sxc.hu/ and was modified with Photoshop. Thank you everyone for the comments and the favs! I really appreciate it. EEEEEEEAAAAHHHHH! Chibi bleach! They're soooo cute! But Kon is perpetually a chibi, isn't it ?! It's so cute, especially for the chibi, but I don't like you make them all and fit all of them in one wallpaper like this. People will be confused, and it's not very good idea. Let's say.... If you want to put Kuchiki and Inoue with school uniform, it's kinda better if you put the other character with their school uniform, or ordinary shirt. If you want put them with their shinigami outfit, it'll be better if you remove the Kuchiki and Rukia with their school uniform. And so does Ulquiora and Grimmjow, why they're in shinigami world? They'll be totally confused people. MizuuHime -> I understand very well what you mean and you're absolutely right. This is my first wallpaper on Minitokyo and I've done it too hastily. I will think of it in the future! Thank you very much for the comment. I could die from their cuteness.. I especially like Rukia's pose. It really brought back memories when Bleach was still in it's early episodes... Nice work!